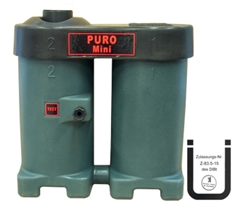 The PURO MINI is designed to separate oil from condensate that is extracted from compressed air systems. The PURO MINI condensate separator covers compressor capacities up to 3.5 m³/min. The separation method of the PURO MINI is the same as its larger family members and therefor offers true condensate separation values for the smaller compressor applications.